Sounds like the name of a rock band… Twenty-Two Elements. And yes, they are basically rocks. 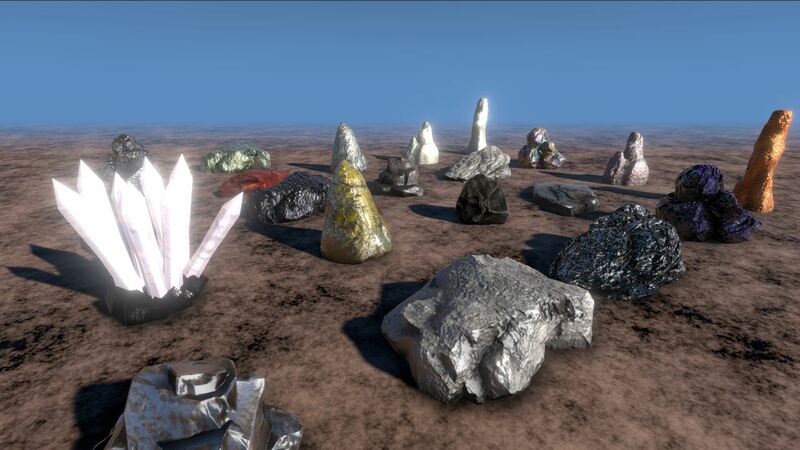 This week, I’ve hunted for various rock and stone 3D models on the good old ‘net. After finding a bunch, I customized each one in an attempt to make them look like the 22 elements in the game that you can pick up using your terrain vehicle. Aluminum, Antimony, Chromium, Cobalt, Copper, Endurium, Gold, Iron, Lead, Magnesium, Mercury, Molybdenum, Nickel, Platinum, Plutonium, Promethium, Rodnium, Silver, Tin, Titanium, Tungsten, and Zinc. Of all these elements, two doesn’t exist in real life – Endurium and Rodnium. For all of the others, I looked around for reference photos and tried to base my creations somewhat in reality. Unfortunately, about 75% of the elements listed look like a silver rock. So I tried to make some variations in the silver color and shine. Here is a video of a test scene with all 22 of the elements laid out. A few are easy to spot right away – such as gold, copper, and cobalt. So is the intent like the original, to just run over elements as you see them with the TV? What is the viewable range that you can discover them? Actually, I’ve made it so that you can collide with them since it looks really weird driving through 3D stuff. It changes the gameplay slightly but I think the spirit of the original game is intact. By going into “Map” view you can zoom out and see them. I have roughly tuned the map view so the viewable range is about the same as the original game. Hi Marvin, chemistry nerd here. I was thinking about the appearance of the elements. It’s true that in their pure form most of these elements are just grey, but some of them also exist as brightly-colored minerals or salts. Chromium chloride can be deep purple or dark green, cobalt chloride can be blue or magenta, copper oxide is green, and mercury sulfide is brick red. So if you wanted to give the elements a bit more visual variety in a way that’s still grounded in science that might be a way to go. The remake looks sweet and I’m blown away at how fast you’re getting it done. Can’t wait to have a crack at it. Great – can you do me a favor? Click on “community” in the menu bar at the top of my blog, create a forum account, and make a post somewhere listing all of the elements and the colors you think they could appear as. Each element can have two colors – a base color (the dull rough part) and a specular color (the color it gives where strong lights reflect off of it). I can go back and update the colors on each of those elements.